For a brochure about MDA Australia’s “Tree of Life Program”, click HERE! The TREE OF LIFE will grow as family and friends celebrate and honour a loved one. 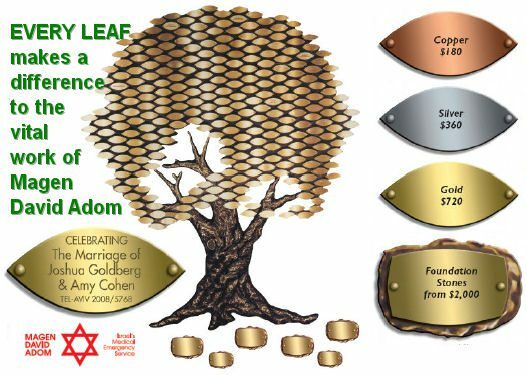 With your donation, an engraved leaf or foundation stone will be placed on one of our Trees of Life located at MDA Australia sponsored MDA Medical Emergency Stations at Krayot or Yokneam. As a donor, you will be able to choose up to six lines of your own wording. Whether you are celebrating a simcha or honouring a relative or friend, your donation and generosity will be visibly associated with Magen David Adom’s lifesaving work in Israel. For more information, click on the link above or contact your State Magen David Adom office.